here is the last card in my My Minds Eye My Girl series. 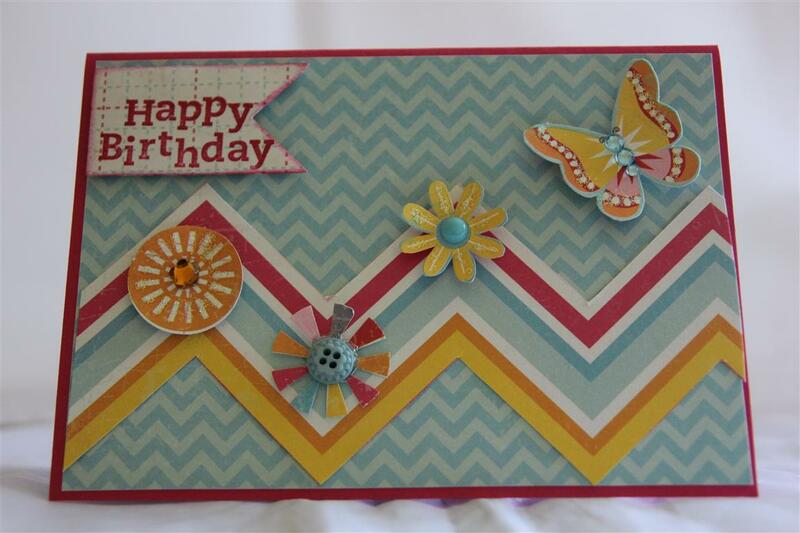 Just a bit of fussy cutting, a bling strip and some ribbon and inking on this one! 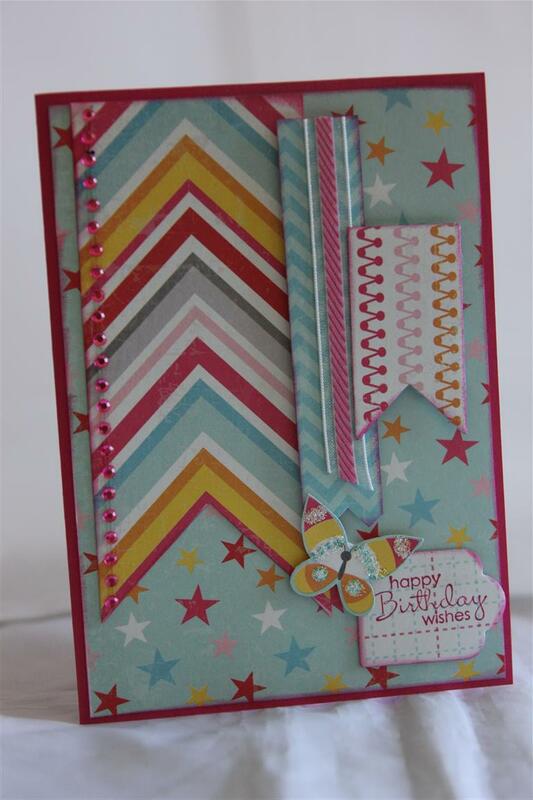 Cardstock is stampin up Melon mambo. Tomorrow will be some mens cards, but tonight i may spend a little time in the craft room – one last push on the Mothers day cards! Til tomorrow…. My Minds Eye My girl number 4, and so simple – just a little fussy cutting for the flowers and butterfly, and the addition of a button, my minds eye enamel dots, and bbling. 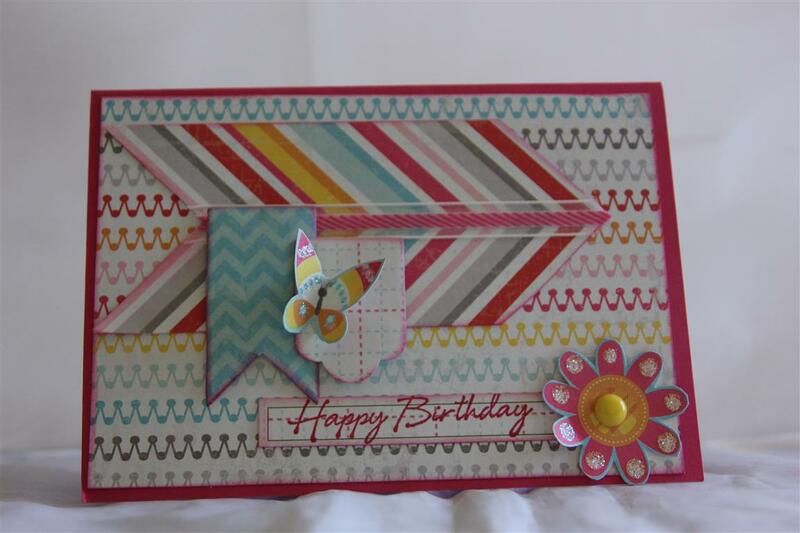 The cardstock and ink are Meleon mambo from stampin up.back to work today, so no crafting tonight – just a litle tv, and early to bed for me! Til tomorrow…. 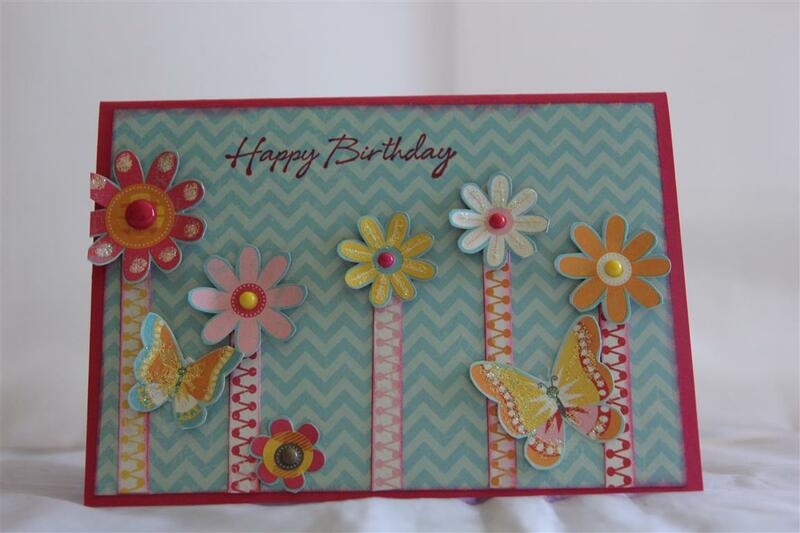 Number 3 in my My Minds Eye My Girl series – I made good use of the designs on the patterned papers for this one, and die cut ( using stampin up hearts a Flutter dies) a couple of banners, and fussy cut a flower and butterfly as well. The sentiment stamp is from hero arts, and I used stampin up Melon Mambo cardstock and ink.I taught a class today, and while in the shop grabbed some more of this paper, as I think we will be doing cards very similar to these in one of my may classes – I just love the bold bright statement! Til tomorrow…. Another bright card, to match my mood, much improved now that the weather has cooled down and I can finally craft and create in comfort! My Minds Eye My Girl papers, I fussy cut some flowers and butterflies, and created stems from more of the same paper. Just added some My Minds Eyeenamel dots, kindyglitz and inking around the edges and another quick card. Til tomorrow…. Now onto bold and bright girl cards. the paper for the next few cards is My Minds Eye my Girl paper, full of gorgeous bright colours and shapes that cry out for you to get those scissors out! 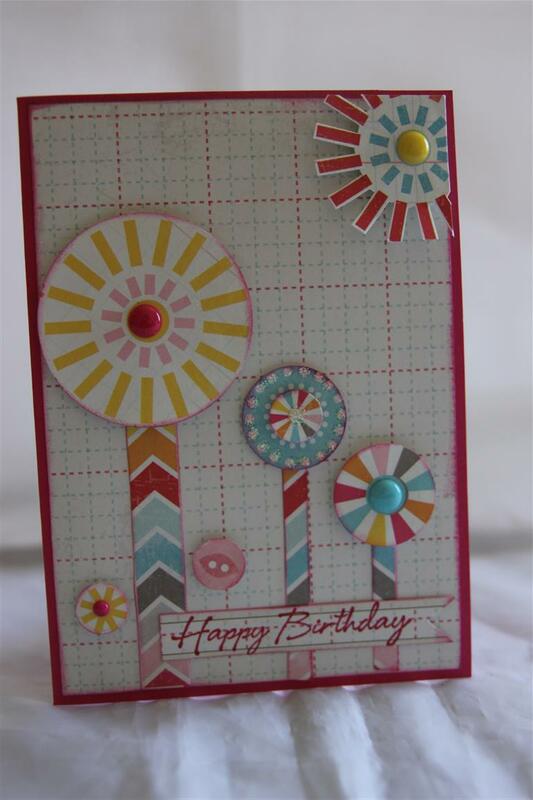 For this first card I cut strips, punched circles, fussy cut a little and edged everything with Stampin up ink – Melon Mambo, which is also the name of the cardstock used. hero Arts sentiment stamp, and my minds eye enamel dots for the centre of my punched circle flowers, and this one was finished! Today I have planned out my retirement village lesson, and am now ready to just create! til tomorrow….